The Bible Available in Gullah! De Nyew Testament is now available in Gullah! It is published by the American Bible Society. An now A da gii oona a nyew chaage. Oona fa lob one noda. Same fashion A done lob oona, same fashion oona fa lob one noda. Ef oona da lob one noda, ebrybody gwine know dat oona me ciple dem. This Gullah translation of the New Testament of the Bible was in production for 26 years and finally, after all the translating, editing, checking, typesetting and printing, it has now been released to the public. There was a launching of the Gullah New Testament at the Heritage Days Festival on St. Helena Island, SC, November 12, 2005. Copies of the Gullah New Testament are now available at the Penn Center and the JAARS Center and through bookstores in the lowcountry, and through www.bibles.com or www.amazon.com. For telephone orders, call 1-800-32-BIBLE (1-800-322-4253). "Fa de fus time, God taak to me de way I taak." Click here to read the Gullah Nyew Testament as a PDF! Click here to see the Gullah Nyew Testament in searchable HTML format, with concordance! 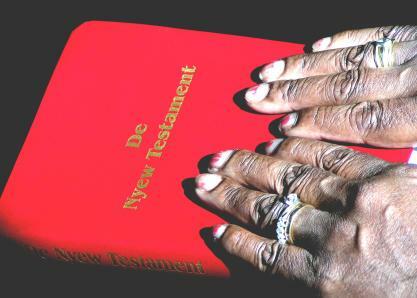 The Gullah Nyew Testament is also available for download on a mobile device through YouVersion or MySword (Android). Click here to see more quotes on Gullah and the Gullah Nyew Testament translation. Click here to see the Gullah Nyew Testament translation in the news. Click here to see a map of the approximate area where Gullah is spoken.